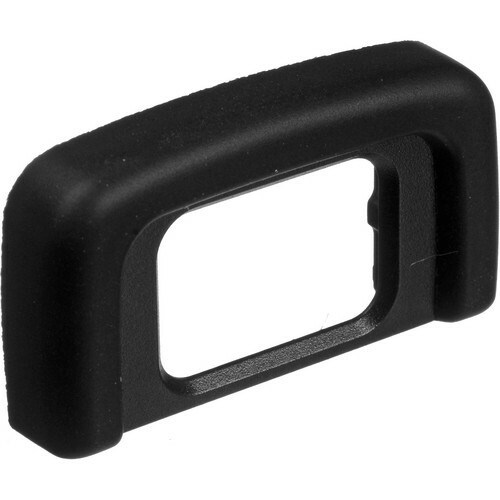 The Nikon DK-25 Rubber Eyecup is a replacement for the eyecup included with the D5300 DSLR camera. It allows for more comfortable viewing through the camera's viewfinder. It also decreases the amount of stray light that can enter the viewfinder and cause flare. Box Dimensions (LxWxH) 3.0 x 2.5 x 0.1"
DK-25 Rubber Eyecup is rated 4.9 out of 5 by 16. Rated 5 out of 5 by Mark from Good to have a spare This DK-25 Rubber Eyecup serves as a spare for my Nikon D5300 camera. Based on experience, I found that on rare occasion, these parts are lost during photo jobs and on travel. However, the design of this eyecup has been improved from that of prior Nikon bodies and is much less likely to come off. I would like to see Nikon take one more step and integrate the screen darkener with the eyecup or viewfinder. Rated 5 out of 5 by Tanner Buggs from Perfect for my D5500 I bought a cheap replacement off @, and it was awful. Then I contacted Nikon asking for a replacement and they told me to ship my camera to them so they can replace the part... This was the real deal and what I was looking for the whole time. I should have just went to B&H and saved myself some trouble! Rated 5 out of 5 by jhslpm from Perfect fit Original rubber eyecup. I lost mine so I had to replace it. Other brands may have good fit, but for the price I ordered the original Nikon and i'm satisfied. Excellent package protection and fast shipping by B&H. Rated 5 out of 5 by Daniel from Works great It's a perfect replacement for the original which had the rubber peel. I don't know why Nikon designed it the way they did, but if you lose yours or mangle it, this replacement works great. Rated 5 out of 5 by OsborneOddities from Perfect fit! Item arrived on time, as always with B&H. It was exactly what I ordered & a perfect fit for my camera! Rated 5 out of 5 by Andrew from Quality product Original Nikon replacement parts are always the best. Not easy to get the original one nowadays. Rated 5 out of 5 by Asanch from Essential part, free shipping This essential part was available and shipped to me with no shipping costs. Great! Will this eyecup be comparable with D5500? Yes, this snapped right on my Nikon D5500. Will this eyecup fit a d5100? It seems the design would work better than the dk20 with glasses. The Nikon DK-25 is only compatible with the D5300. Will this fit a Nikon D3300? what is the diff between this and the one that comes with the camera? There is no difference, I lost mine and replaced it. I do not know, it fit my D5300.